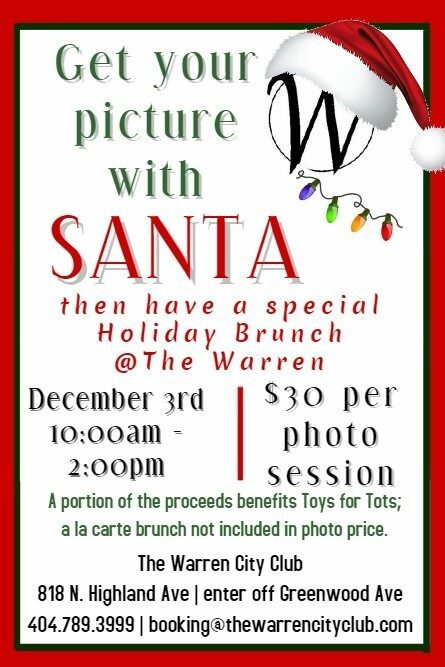 Santa Pictures & Holiday Brunch! Each ticket is good for one photo and can include your whole family! ** Tickets are available by 1 hour time slots. Families will be called up for photos, during their time slot, in the order that their entire party arrives at the Warren. Space for this exciting event is limited, so purchase your ticket now. A portion of the proceeds for this event will be donated to Toys for Tots. You may also include a monetary donation when you purchase your tickets or bring an unwrapped present to the event, which we will deliver to Toys for Tots. Within 1 week of the event, our photographer will make the high resolution photos available to you for print and/or download. Don’t miss this chance to get your holiday card photo taken, enjoy a delicious brunch and give back to a worthy cause. *The purchase of this ticket is for your Santa photo shoot only and does not include the price of brunch.